If you’re thinking that a compact system may not be enough for you — perhaps your living room is large or sometimes you need a that extra high volume, or that you simply want everything to sound better — then let us give you the low down on some current highlights across four price categories. KEF iQ90 (€998), Denon PMA / DCD / DNP 720 together for €890, 2x high quality RCA cable to each €26 (AudioQuest ‘Evergreen’), Chord Carnival 2x3m speaker cables ready-to-use at €70. Our ‘Evergreen’: As before, a real highlight, especially when in close quaters of the pop /rock music areas The Denon components are in excellent workmanship and are controlled via a very good universal remote control and FM, CD, iPod /iPad, & Streaming Internet Radio. A turntable can be connected directly. Price to performance ratio: Excellent! Short on space, on a budget – but high demands on audio? 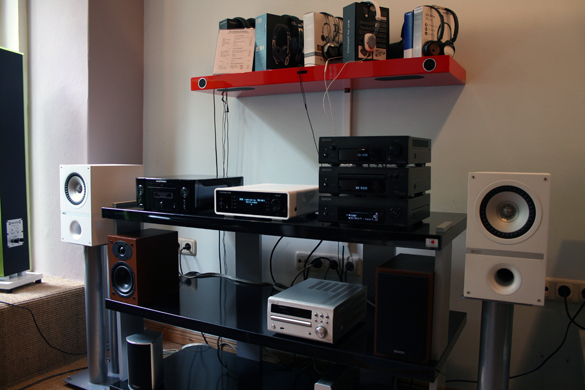 Buying compact HiFi at a budget-friendly price doesn’t preclude getting great value for money! Generally we reccomend smaller units for smaller spaces — a combination that works very well! However with smaller sets the price/performance ratio is still excellent with selected mini-systems, particularly the electronics of many small models stand out with top-quality processing, operation features and performance. When choosing the set as always, tastes vary. We have some exceptionally well-harmonised combinations here – of course there are further possible combinations which we can gladly discuss on a case-by-case basis with you.